Wichita has a long tradition of hosting sporting events of all sizes, like youth and amateur sports, the NCAA Division I men’s and women’s basketball championship tournament games, and to professional events. 2018 is the year for showcasing Wichita as a Midwest sports destination for big and unique events. In January, the Midwestern and Pacific Coast Synchronized Skating Sectional Championships was hosted in downtown Wichita because of our rare three sheets of ice within about eight blocks. In March, opening weekend games of the NCAA men’s basketball championship took place at the 15,000-seat INTRUST Bank Arena. In August, the USA Waterski and the American Water Ski Association National Championships will use the world-class lakes at Mystic Lakes Ski Club. In October, the United States Bowling Congress’ (USBC) 2018 U.S. Open will take place at Northrock Lanes. Visitors not only enjoy thrilling competitions while they are in Wichita, but also the city’s energetic vibe, numerous amenities and well-known hospitality. 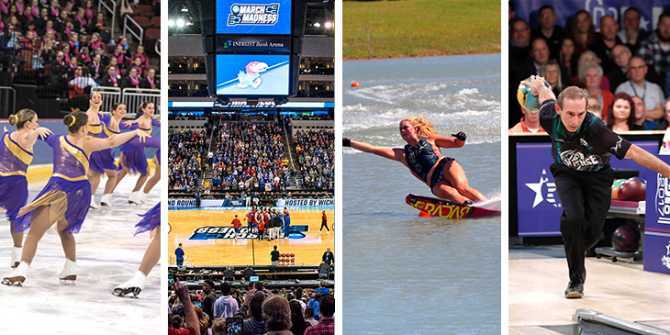 Here are five ways Wichita is a winning sports event destination. Wichita has a wide variety of facilities to handle all sizes and types of events. One of the newest and most used facilities is the Wichita Sports Forum, which made SportsEvents magazine’s 2017 list of Top 10 multi-use sports facilities in the country after just its first year in operation. More than 1.8 million visited the 148,000-square-foot multi-use complex last year, and that number will climb in 2018 during its third year. The complex has enough hardwood for six full-size basketball courts that can convert to 10 volleyball courts, a full-size turf field that can be used for soccer or as a softball or baseball infield, eight batting cages and indoor sand volleyball courts. In addition to traditional activities, the facility hosts off-brand sports like national roller derby, wrestling, Ultimate Frisbee and boxing. Meeting planners and participants rave about the proximity of multiple facilities, which simplifies event management. Wichita has more than 8,000 hotel rooms ranging from economy to luxury. That includes 245 added in 2017. Another 410 rooms are projected to be added this year and more than 200 in 2019. There are things to do in Wichita for everyone. In addition to the seventh-largest zoo in the United States and the most-visited outdoor attraction, Wichita has more than 1,000 restaurants, 34 museums, 23 attractions, 22 live theaters, 17 festivals and eight shopping districts. When they are not competing, participants will find unforgettable experiences with Midwest hospitality and service. Wichita’s central location in the middle of the Heartland makes it easy for participants to get here whether they are traveling by land or by air. The city is at the junctions of I-35, I-135, US Hwy 81 and US Hwy 54/400, and seven airlines operate from Wichita Dwight D. Eisenhower National Airport. Free Q-Line trollies make getting around the downtown area a breeze. It’s easy to visit Wichita and stay on budget. Budget Travel magazine ranks Wichita as one of the best budget destinations in America, and the city has earned similar accolades from Trivago and MSN. If Wichita isn’t on your consideration list, it should be! Contact Josh Howell to learn more.